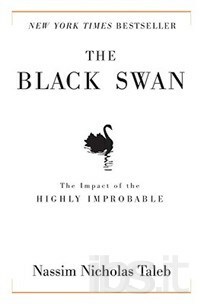 The black swan story was mentioned by Nassim Taleb in his earlier book Fooled by Randomness. It only takes the appearance of one black swan to turn the notion that all swans are white into absurdity. In the book The Black Swan, he took the idea to the next level and explained the impact of the highly improbable events that we must face. A black swan in this context is by definition a highly improbable event that could have very serious consequences. By its nature, its occurrence cannot be predicted. It happens in rare occasions but we cannot be sure when. What we can be sure is the severe impact when it happens. Black swan can be good or bad. It can bring sudden fortune or it can bring catastrophe. The problem of black swan is that its probability of happening is usually ignored and the consequences not prepared for. One interesting example is what happens to a turkey being fed for the Thanksgiving dinner. The turkey is well treated and well fed for 1000 days and is then slaughtered to be presented on the dinner table. To the turkey, 1000-day is a long time and every indication and statistics prove that it will live happily forever. The 1001th day is a black swan event. Although it is very rare and cannot be predicted by the turkey, the impact of the event is fatal. We also face many highly improbable events which have serious consequences. But we, just like the turkey, usually ignore them. Human are worse than the turkey because we know the consequences of these events, just that we are not aware that they could really happen. We cannot see the black swans owing to the opacity we created. First, there is an overestimation of factual information, combined with an overvalue of the intellectual elite. This leads to a retrospective distortion of historical events. With hindsight, we create simple causal relationship of historical events which in fact are random or governed by complexity which we do not understand. From these, there is an illusion of understanding of current events. This false understanding makes us unaware of the black swans. The author proposed that there is a deep root problem with our world view of the Platonic idealism. We are more comfortable seeing the world as something structured, ordinary, and comprehensible, which is the essence of Plato's philosophy. Such "Platonic fallacy" disregards the reality of unpredictable events and leads to three distortions. Narrative fallacy: We often create a story post-hoc so that an event will seem to have an identifiable cause. This is quite noticeable if you watch the commentary on TV on the reasons why the stock market rose to a new height yesterday, with many events being observed as the undeniable causes. When the stock market fell the next day, the commentator would explain the reasons of the fall with observation of events leading to the crash, but which he did not notice just twenty four hours ago. Ludic fallacy: Randomness to many of us is just like rolling dice. The randomness found in games, thus the word ludic, is structured randomness bound by limits. However, randomness found in life is unstructured. This is why many modern probability theories are inadequate in explaining real situations. An example of this viewpoint is again rolling dice. When the results of one hundred rolls all yielded six, the probability expert would explain that the chance of six in the next roll would still be one-sixth. However, a person with real life experience would notice that the dice must have been fixed and the chance of six in the next roll is extremely high. Statistical regress fallacy: Statisticians, economists and financial analysts falsely believe that the structure of probability can be delivered from a set of data. The author rebutted the predictive mathematical models used to predict the future. He said statistics only work in some domains like casinos in which the odds are visible and defined. The argument is that predictive models are based on platonified forms, favouring mathematical purity and failing to take some key ideas into account. The simplified statistical models cannot be used in complex domains such as social-economical situations. The statistical models fail because of the impossibility to be in possession of all the information, that very small unknown variations in the data could have a huge impact, and that theories based on empirical data are flawed, as events that have not taken place before cannot be accounted for. In particular, the abused use of the Gaussian bell curve is worrisome. This theory of statistics on normal distribution, which is now used in almost all situations, is quite limited because its central assumption is to ignore rare random events on both far sides of the bell, claiming that such events would only create negligible variations. It fails to recognize that, in real life situation, one black swan could significantly change the entire statistical result. The most useful advice of the book is hidden in a small paragraph. Perhaps the author did not wish to make it apparent in case it would lead to great losses if the readers just take it for granted. It is about the portfolio management of investment risk. Black swans struck several times in the last decade leading to large gains or large losses in investment. The conventional wisdom of investing in companies with good track records is not enough to prevent black swans. Instead, the author suggested that, in order to keep away from bad black swans and catch good black swans, an investment strategy could be the parking of majority of assets to cash deposit or bonds which have a high resistance to market collapse, while using a small portion of the assets investing in highly volatile market with the prospect of good black swans of sudden rising stars.